Kids love the idea of heroes. There is no better way to get the attention of elementary aged boys then talking about Superheros. That’s why this curriculum for children’s church will be a powerful addition to your ministry on Sunday morning. This is a brand new 12-Week Children’s Ministry Curriculum from our friends at Children’s Ministry Deals. 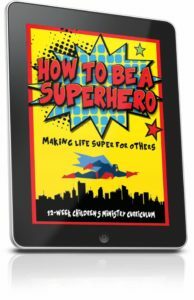 It’s appropriately titled, “How To Be A Superhero.” It’s already become one of their best selling resources (and that is saying a lot). Kids love superheroes. Adults love superheroes. Superhero movies are #1 at the box office. This series teaches kids how to make life super for others. And you can download the first lesson for free. It’s all about teaching kids to love their parents. Each lesson in the series connects a well known Bible story with famous super-hero story. You could use these in Sunday School, Kids Church, or even a Mid-week semester of VBS. 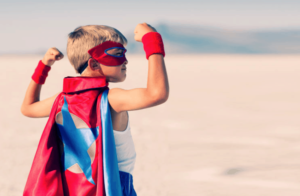 Jesus is the ultimate superhero and you can learn a lot from the heros of the Bible too. Click through to their website to download a sample lesson. Kids will anticipate which hero will come next week as they study through the series. Batman, Superman, Green Lantern, Ant Man, Avengers, Spiderman and more. Make It Stick! Parent Sheet. This study is based on Ephesians 6:1-3. It highlights the importance of parents and obeying them (even for soon-to-be superheros). Kids will learn from James 1:19-21 about taming the tongue. This component of self-control is essential for helping others. The lesson plan from Genesis 45, when Joseph saves his family. When bad things happen, God can use that to do something good. Based on Luke 10:1-24. Jesus is our source of power. Bible lesson from 1 Kings 19:1-18, the story about Elijah fleeing to the cave. Scripture lesson from 1 Corinthians 12. We all have special gifts from God to use in helping others. This lesson is from Acts 10 and the story of Peter and Cornelius. Everyone needs friends on their team, especially friends who are different. Jesus heals a man with a crippled hand from Scripture: Mark 3:1-5. Little things matter, and God wants us to have hearts that are always willing to lend a hand. Scripture: Luke 10:25-37, The Good Samaritan. God wants us to move quickly when people are in need and not wait for someone else to act. The story of Esther 4, Mordecai asks Esther for help. God’s heroes aren’t only serving on the mission field. They serve at home, where God put them. This lesson is from the Great Commission given by Jesus in Matthew 28:16-20. Having received the gift of Jesus, we have a responsibility to share that good news with others. Bible study on Acts 16:16-40, where Paul and Silas in prison. God can give us the strength to persevere when times are tough. Tony Kummer (Editor) reviewed & updated this page on : August 18, 2016 at 9:07 pm. All our content is peer reviewed by our readers, simply leave a comment on any post suggest an update.